​Costa Rica has something for everybody! Whatever your interests; eco-tourism, bird watching, adventure tours, fishing, diving, rafting, golf, or just relaxing on an unspoiled, tropical beach you'll find all of that and more in this tropical and secure paradise. So come and experience one of the most exotic and undiscovered vacation destinations in the world, boasting unsurpassed natural beauty and an impressive array of distinctions: towering and fiery volcanoes, pristine beaches, raging rivers, virgin rain forests, abundant wildlife, warm and hospitable people and much, much more!! Costa Rica is Central America's jewel. It's an oasis of calm among its turbulent neighbors and an ecotourism heaven, making it one of the best places to experience the tropics with minimal impact. It's also mostly coastline, which means great surfing, beaches galore and a climate built for laziness. Thrill seekers can fly through forests on zip lines, peer into boiling volcanoes, surf oversized waves and dive with dolphins and whales—all in the course of a normal day. Then again, if you have some serious chilling to do, you can always lounge in a hammock and enjoy the pure life, or pura vida—a national expression that sums up the desire to live the best, most hassle-free existence. In Costa Rica, nature reveals itself in its entire splendor. 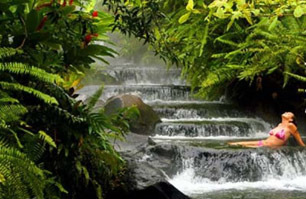 Considered one of the most bio-diverse regions in the world, Costa Rica is divided in 20 natural parks, 8 biological reserves, and a series of protected areas that captivate ecotourism lovers. The variety of activities includes horseback riding, hiking mountainous paths in the cloud forests, and guided bird-watching tours. Tortuguero National Park is especially famous for sea turtle nesting that takes place every year, and the natural canals that abound with protected species such as crocodiles, manatees, and otters. One of Costa Rica's main attractions is the Arenal Volcano. 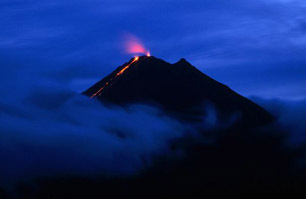 This active volcano will delight lucky visitors with a fire show, with rock and lava eruption. At the volcano's foot, visitors can find one of Costa Rica's best windsurf spots, because winds on the lake can reach 45 miles per hour. In addition, those looking for a little adrenaline rush can go bungee jumping from the bridge over the Colorado River (located just one half hour from San Jose) or riding in a hot-air balloon. 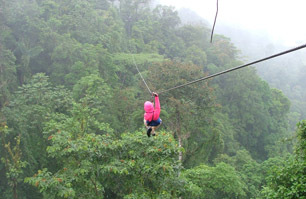 Visit this website for FAQs and general information about traveling to Costa Rica.